After a properly lazy day on soggy Saturday, I was back down the plot on Sunday afternoon to enjoy a burst of Spring sunshine (albeit tempered by some distinctly northerly breezes) and to get the last of this year’s potatoes in the ground. 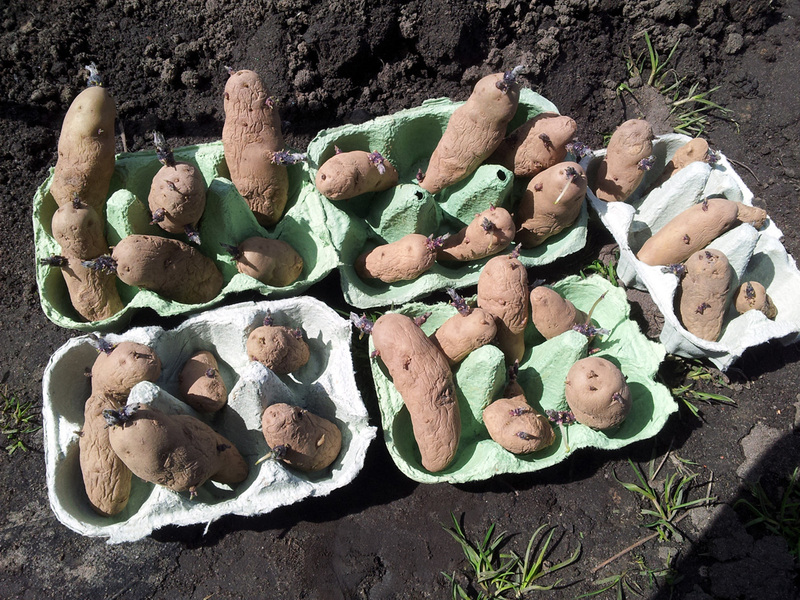 Having already dug and manured trenches and planted out my first early (‘swift’) and second early (‘saxon’) spuds over the past few weeks, it was the turn of the main-crop variety ‘pink fir apple’. I left the job until after lunch to give the ground a chance to heat up and hopefully that absorbed warmth will help to insulate the tubers through the spell of cold weather that’s forecast for the end of this week. There are no shoots showing on any of the trenches yet, but if that changes this week I’ll have to keep my eye on the likely minimum temperatures and if a frost seems imminent, scoot on down and do a spot of earthing-up. A frost won’t kill the plants, but if the early shoots are damaged then it will set them back. Meanwhile, back in the greenhouse, the shelves are packed full of seed trays and modules with all sorts of things that are taking their sweet time to get going. We have a row of broad beans to plant out, once the cold wind stops blowing for a bit, and plenty of pricking out and potting on in progress, with more seed to sow… once we have the space. Again, it’s the chilly temperatures that are holding things back. Still, I think it’s better than the situation we had last year: the heatwave in April, followed by a cold, damp May sent everything out of whack. If we’re actually going to experience a ‘normal’ seasonal growing pattern this year then that won’t be so bad, eh? Let’s hope once the weather warms up it stays that way. Aye, I’ll second that. The forecast is for another northerly blow at the weekend though, temperatures dropping back below double figures. But then again, it is only April. Average temperatures are only meant to be around 8°C or so.